Headaches can be one of the most debilitating side-effects of a cold or flu. According to a recent clinical trial that evaluated people with cold and flu symptoms, more than 60% of those polled experienced headaches related to their illness. When you’re on the go, even sunlight and movement can cause sensitivity, making it difficult for busy parents to get through the day. So, what causes cold or flu headaches? In both colds and the flu, swelling and mucus can accumulate in the sinus cavities which may lead to sinus pain and other headache symptoms. Sinus headaches are associated with a deep and constant pain in the cheekbones, forehead, or bridge of the nose, which worsens when you bend over. In other cases, though their symptoms might feel similar, headaches that come from the common cold can be different than headaches that come from a flu virus. 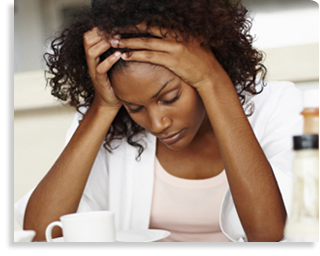 Headaches that occur during a cold are often due to the release of immune response molecules called cytokines. While their job is to help the body ward off the virus, the release of these molecules is known to cause headaches. Headaches that come on during the flu are often caused by a fever. During fever, blood vessels become enlarged – increasing pressure in your head and causing headaches. Acetaminophen (one of the active ingredients in Contac® Cold + Flu is a powerful pain-reliever and fever reducer, making it an excellent choice for both cold and flu headaches. Any time a headache is the only symptom, it is not likely to be due to a cold, flu, or sinus infection. In other words, cold and flu headaches are almost always present with other symptoms like nasal congestion, sneezing, coughing or fever. That’s why multi-symptom OTC medications like Contac® Cold + Flu are so effective at treating headaches caused by cold and flu. With Contac® Cold + Flu products, you can rely on one medication to manage all your symptoms, rather than combining multiple medications to get through the day. With a multi-symptom remedy like Contac® Cold + Flu, you are taking a safe and effective combination so don’t worry about drug interactions or combining active ingredients. 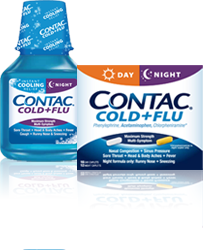 The nasal congestion, fever and pain associated with cold and flu viruses can be easily managed in one dose of Contac® Cold + Flu.